It gets even worse if the game is close in the 4th quarter - the "comeback code" has made this game nearly unplayable - has there ever been a fix for this? No amount of actual tweaking within game will stop this. Those 75+ passing TDs ... are they the "Receiver breaks a tackle and is off to the races" type or the Deep Bomb type? I was playing with a slider set a while ago. Not perfectly sure what did it, but a combination of Knockdowns at 35, Punt Catch Interference at 5, Defensive Pass Interference at 77 and Offensive Aggressiveness at 30 allowed me to see a few games with the QB not trying a 50+ yard pass. The only 73 pass TD the CPU QB did against my team was a 15 yard reception with a few broken tackles (Poor tackling is poor) and whiffed tackles that was taken the distance. I would estimate that more than 50% of the long TDs I see in the passing game are due to poor tackling after a short to medium route catch. I wonder if you managed to get any improvement when it comes to the sacks. So far, unless the QB is a scrambler, I can't get more than 1 sack per game, if I do get one (Usually when it is Tom Brady running a WR Screen play and not throwing the ball fast enough). Even when I'm user controlling a D-Lineman and just bursting into the backfield, the QB tends to throw the ball very, very fast. 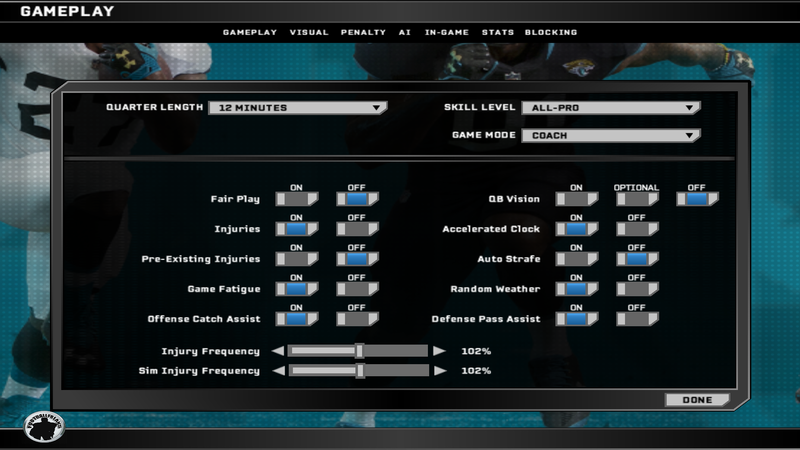 The reason being is that in my franchise I play out all of the Jaguars gams CPU v. CPU, but all other games are fast simmed. If I played out the Jags games at 15 min quarters by the end of the season my primary RB would have 100 more carries than the rest of the RB1s in the league and my QB would have 100+ more pass attempts. At 12 everything matches up with the rest of the league's stats and, in addition, as seen above, they also match up nicely with real life NFL stats. 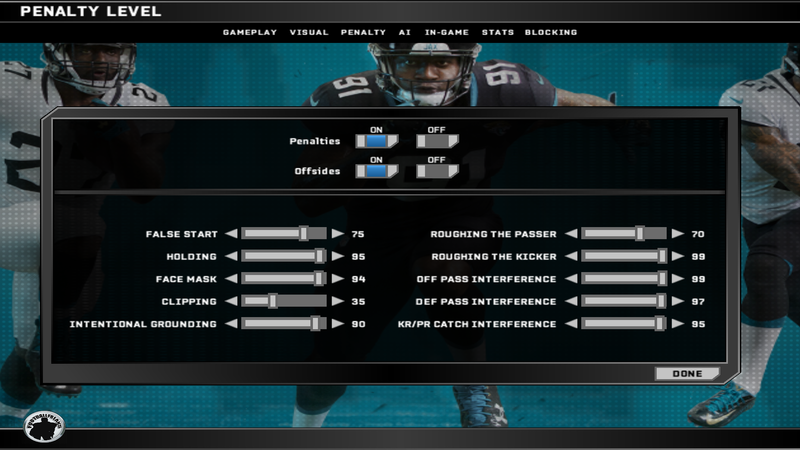 From history, from what I recall, Fast simming games within Madden are not affected by sliders, Not talking about the speed option in Cal's scripts which does. Sorry, not getting your point. You can fast sim games or simulate games in Madden, one by one or the entire week or season correct? I think what cdcool means is that fast simmed games (AKA any game you don't watch) are not affected by any AI slider or penalty slider configuration, other than the coach sliders. However, played games (AKA games that you do watch) are affected by the slider sets. And you can use the Speed Up CPU vs. CPU games to ... well ... speed up those games if needed.